(Nanowerk Spotlight) Tissue engineering is a difficult task where living cells must be organized into tissues with structural and physiological features resembling actual structures in the body (read more: "Tissue engineering meets nanotechnology: A look at tomorrow's medicine"). The ultimate goal of tissue engineering as a medical treatment concept is to replace or restore the anatomic structure and function of damaged, injured, or missing tissue – ultimately providing doctors the ability to replace entire organs. 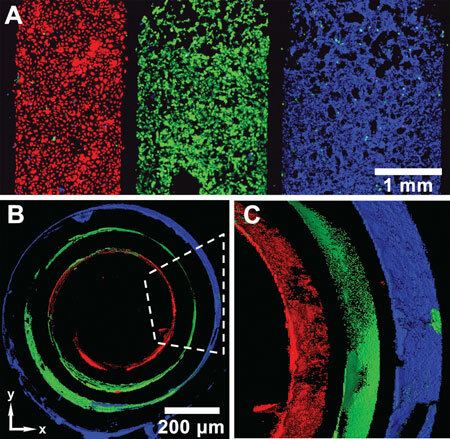 At the core of tissue engineering is the construction of three-dimensional scaffolds out of biomaterials to provide mechanical support and guide cell growth into new tissues or organs. In another advance for the field, researchers have now demonstrated a strategy to fabricate tubular structures with multiple types of cells as different layers of the tube walls. This method may be widely used in simulation of many tubular tissues and enriches the toolbox for 3D micro/nanofabrication by initially patterning in 2D and transforming it into 3D. "Tubular tissues such as the trachea, blood vessels, lymph vessels, and intestines, have two distinguishing features" Xingyu Jiang, a professor in chemical biology at the National Center for Nanoscience and Technology in Beijing, explains to Nanowerk: "They have specific 3D shapes;and they have different types of cells at specific locations, i.e. different parts of the tube wall are made up of different cells. Mimicking both of these features is a prerequisite for fabricating functional tubular tissues in vitro, and the realization of structural-tissue mimicry may have wide applications, but remains challenging." In a paper in a recent issue of Advanced Materials ("A Strategy for Depositing Different Types of Cells in Three Dimensions to Mimic Tubular Structures in Tissues"), Jiang and his team report a new fabrication strategy that results in stable tubular tissue with a high structural similarity to many biological tubular tissues. Using a stress-induced rolling membrane (SIRM) technique, the researchers used two fabrication steps for their tubular structures. First, different types of cells were delivered and patterned on a 2D SIRM using micro- and nanofluidic channels. Then, the SIRM was released to roll up into a 3D tube. "We were able to control not only the diameter of the tube and the thickness of the tubular wall, but also the cell orientation inside the tube via the control of cell adhesion on the 2D membrane," says Jiang. "This enables the more precise mimicking of tubular tissues compared with existing approaches." 1) Each kind of cell is precisely distributed at microscale resolution in 3D space, and cell orientation can be precisely controlled inside the tubes. 2) The size of the tubes can be adjusted because the driving force for rolling is internal stress, a parameter that the researchers have complete control over. 3) The rolling time of the tube is short (within minutes), and the tubular structure can last for several months in tissue-like conditions without any external device. To demonstrate the capability of their method, the scientists successfully simulated the structure of a human vessel-like structure – the tubular wall has three layers, and in each layer there is one representative type of cells: endothelial cells, smooth muscle cells and fibroblast cells (from inside out). This kind of tubular structure with multiple types of cells can be applied in tissue engineering such as arterial and venous grafts in vivo. And, as Jiang notes, the preparation method of stress-induced rolling membrane can be applied to fabricate other self-assembled 3D structures. "I think the future directions for our research field are mapped out in two areas" says Jiang: "One is the study of cell growth, migration and differentiation in 3D structures; the other is the functional simulation of tissue engineering scaffolds. Tissues or organs of animal are extraordinarily complex, so it will be a big challenge to really mimic the function of tissues or organs."